Friday June 11th 1926 I wrote Lydia and Hattie in AM. Mrs Moore away in afternoon. I slept some. Very warm. Rain early in evening. Saturday June 12th 1926 Mrs Moore away for the day. I wrote Millie Byington. Did some sewing in afternoon. Went up to Whetstones of an errand. Cora invited me to stay for supper. More rain. Sunday June 13th 1926 Ott came and took me to church. I went home with him. It rained very hard in afternoon. I wrote Fannie, Edith and Mr Junekin in Los Angles. William and Mary away for the evening. The Baby not very well. 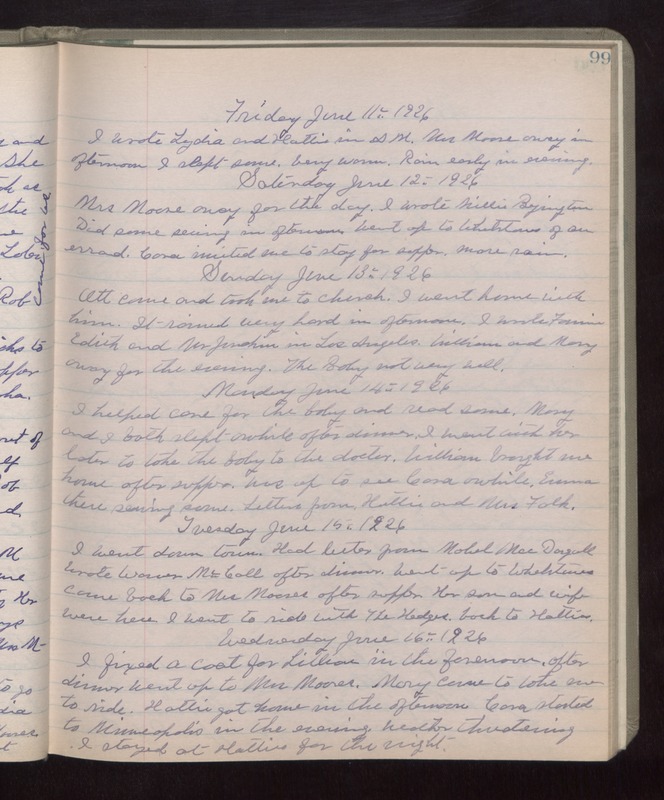 Monday June 14th 1926 I helped care for the baby and read some. Mary and I both slept awhile after dinner. I went with her later to take the baby to the doctor. William brought me home after supper. Was up to see Cora awhile. Emma there sewing some. Letters from Hattie and Mrs Falk. Tuesday June 15th 1926 I went down town. Had letter from Mabel MacDougall. Wrote Warner McCall after dinner. Went up to Whetstones. Came back to Mrs Moores after supper. Her son and wife were here. I went to ride with The Hedges. Back to Hatties. Wednesday June 16th 1926 I fixed a coat for Lillian in the forenoon. After dinner went up to Mrs Moores. Mary came to take me to ride. Hattie got home I the afternoon. Cora started to Minneapolis in the evening. weather threatening. I stayed at Hatties for the night.